Bismarck, North Dakota is on the small side, as most state capitals go. 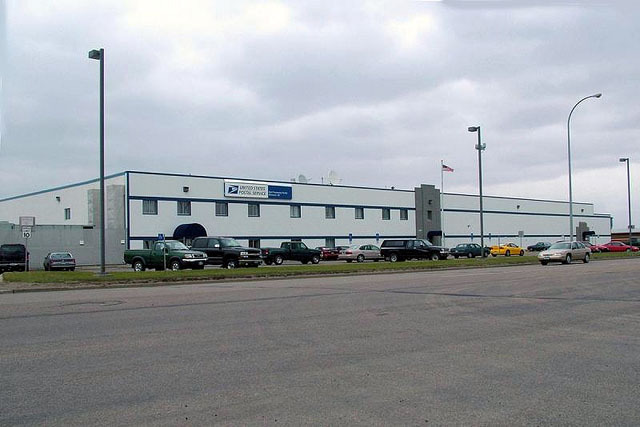 With 55,000 residents the city ranks as the second most populous in North Dakota, though it ranks in the bottom-third when compared with other capital metropolitan areas across the country. Regardless, Bismarck is the largest city for 200 miles in any direction (Fargo, to the east, beats it out), and as such it is important postally speaking. Bismarck and Fargo house the only two remaining mail processing facilities in the state. The capital also boasts a historic early-century Federal Building, which we'll present here. 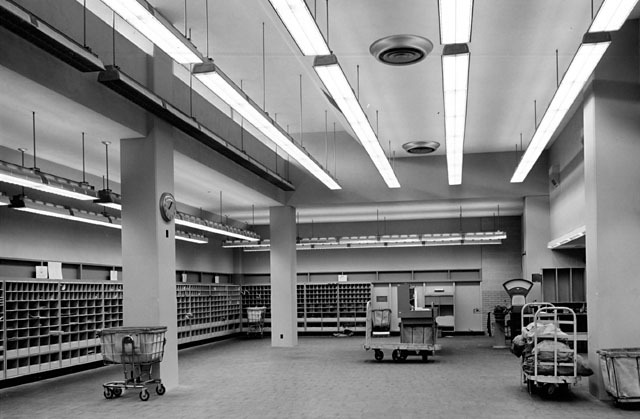 In our next post we'll show vintage photos of the '60s-era facility that replaced it, inside and out. The building is described as part of a National Register of Historic Places nomination form for Bismarck's downtown district. The federal government constructed this three-story building at the northwest corner of East Broadway and North 3rd Street in 1913. Architectural plans for the edifice were prepared by the Treasury Department's supervisory architect, James Knox. 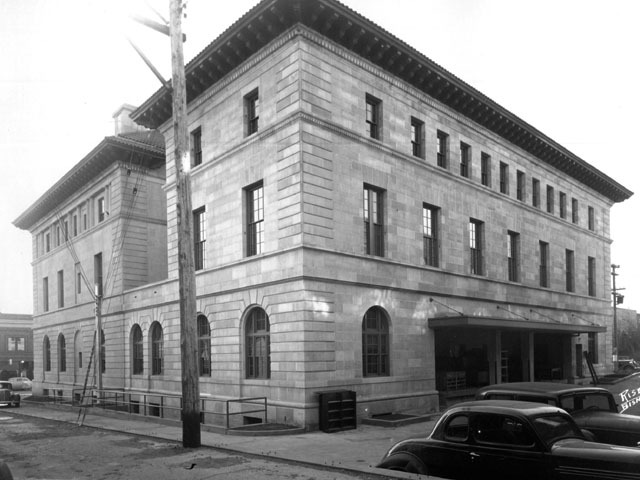 Upon completion, the Renaissance Revival-style building housed a Federal Post Office and District Court, one of only four such facilities in North Dakota. A three-story rear wing was added in 1937. The building was nominated to the National Register in 1976. 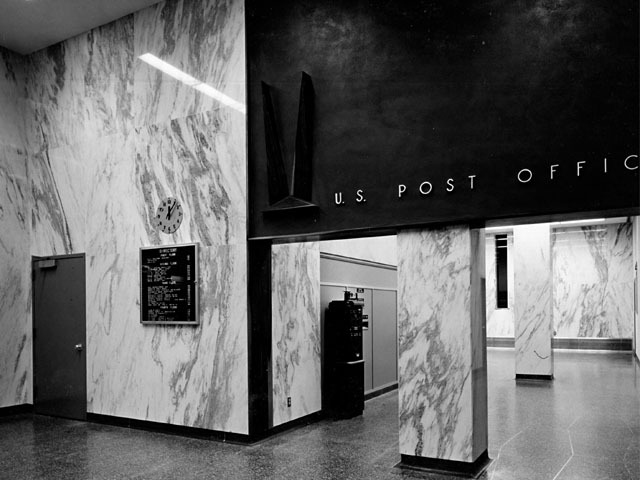 The U.S. Post Office and Courthouse is a steel framed structure veneered on the exterior by limestone ashlar. The Renaissance Revival character of the building is displayed by the rusticated stone work and large arch window openings at the first story; smooth stone finish and simple rectangular window openings at the second story; recessed window openings between paired stone columns at the third story; and quoin details at the wall corners. The building is also distinguished by a prominent hip roof, covered by red tiles and featuring wide eaves underscored by press- metal medallions. The design of the 1937 addition is sympathetic to the original. Here, you can see the building both pre- and post-addition. You can more easily see the dividing line between the original and extended structure from this rear photo, post-addition. Note how the style of the architecture blends largely seamlessly with the original. 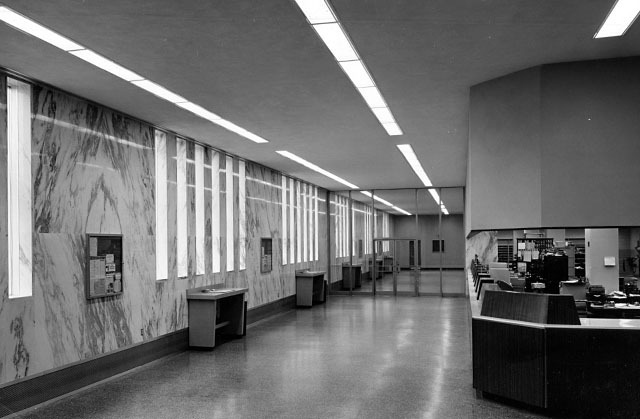 Note: Unlike many other post offices/federal buildings that were expanded during the New Deal era, the Federal Building in Bismarck did not receive any lobby artwork. The General Services Administration (GSA) and National Park Service (NPS) also feature descriptions of the building. 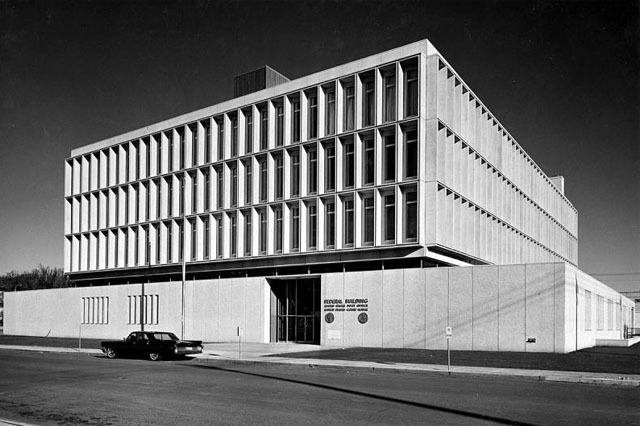 Now we move to the 1960s, to the precast concrete stylings of what is now known as the William L. Guy Federal Building. So renamed in 1999 after a former governor, this mid-century U.S. Post Office and Court House housed Bismarck's (at least non-processing) postal operations. 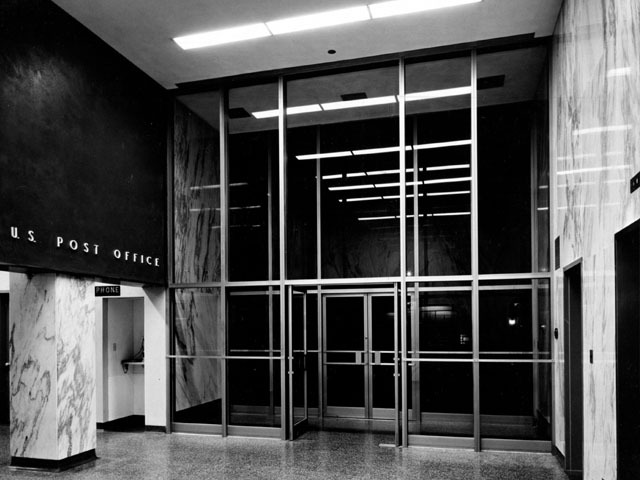 Nowadays, the building houses the only classified (USPS-staffed) postal retail operation in Bismarck: the Downtown Station post office. The facility was designed by architects Leonhard & Askew, and was completed in 1964. The building is located just two blocks north of the original Federal Building, and both facilities are managed by the General Services Administration. Many photos of the newly completed building are available at the National Archives, and they encompass both the interior and exterior of the building. Let's have a look! Inside, dry '60s-style right angles abound; though so do panels of marble and (at least back when) old-style P.O. boxes. 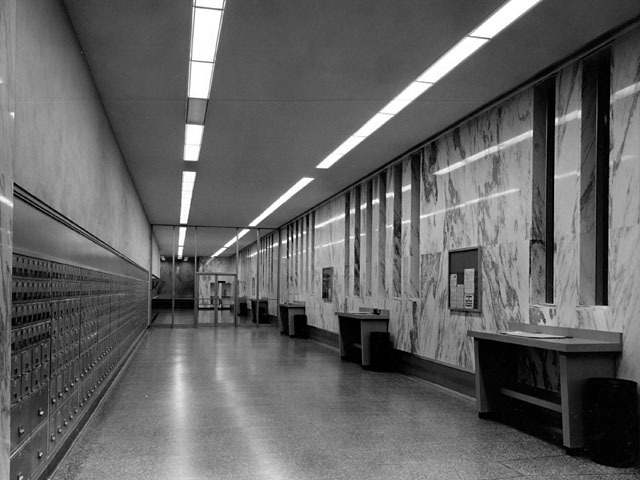 The Archives feature completion photos of the elevator and P.O. box lobbies. As is custom in the Upper Midwest, the P.O. Box lobby (entrance at the 'right' of the building, is available to customers 24/7. (Don't abuse the privileges, thoughthe U.S. Marshals Service is housed in the building. 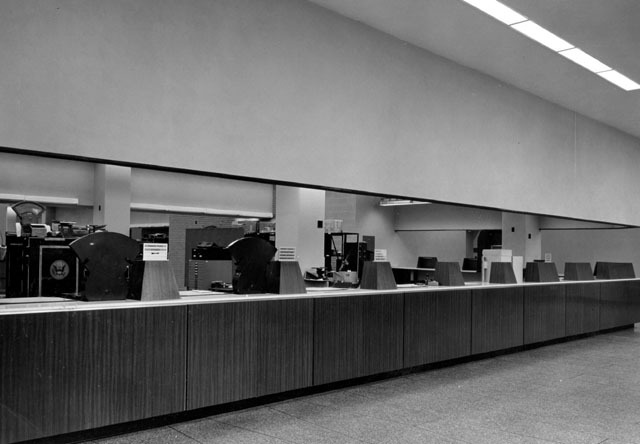 In the service lobby the counters are fronted with what appears to be Formica. (Can anyone with design chops confirm or correct this?) Ah, the 1960s. Compared with the federal buildings of the 1930s, the design is downright spartan. Though check out those vintage postal scales! By this point you might observe that I am really not a fan of utilitarian mid-century architecture. So here's the work floor, lit by enough strings of fluorescent lighting to stretch something like halfway to China. 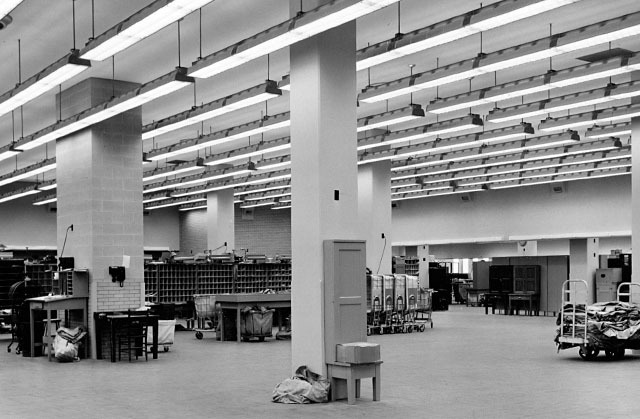 The most interesting thing I see in these photos are the windows from the Postal Inspector catwalks above the floor. 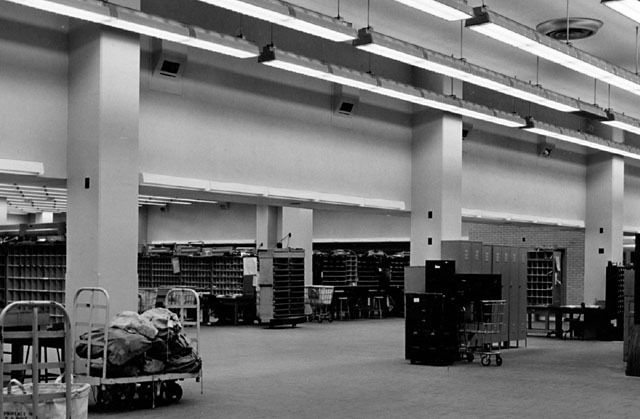 In 1991 Main Post Office and mail processing operations relocated to this 45,000-square foot facility on the southeast side of town. Our friend John photographed it in 2005.